You haven't heard from me in a while. Well I've been kinda busy. First I went to NärCon, which was a blast (more coming), and then I went to the biggest island in Sweden to be medieval for five days. After that I've worked and worked a bit more. So NärCon. Well, I haven't really got any pictures cause I was to lazy to bring my camera. But we got to Linköping at Thursday and decided to take the but that everyone else was didn't take to the con. So ones we got to the Campus area where NärCon took place (my phones gps was a great help that day) we took our place in the queue and stood there for one hour to get our passes (convention wrist bands). It was fun but warm, cause someone decided to turn on the heat that day (not rain like my weather service told me). And I had planed to cosplay that day, but after standing in the queue and getting half growl on the weather I decided not too. Friday started with breakfast at the hotel. It was good and then I and Madiirje stood and put on our cosplay for two hours (Madiirje was nice enough to tame my savage beast wig) before we ended up at the con. And Friday was Firefly day. I even think we meet up with another Inara and a Jayne from an another Firefly group that we totally missed. A bit more serious photo. 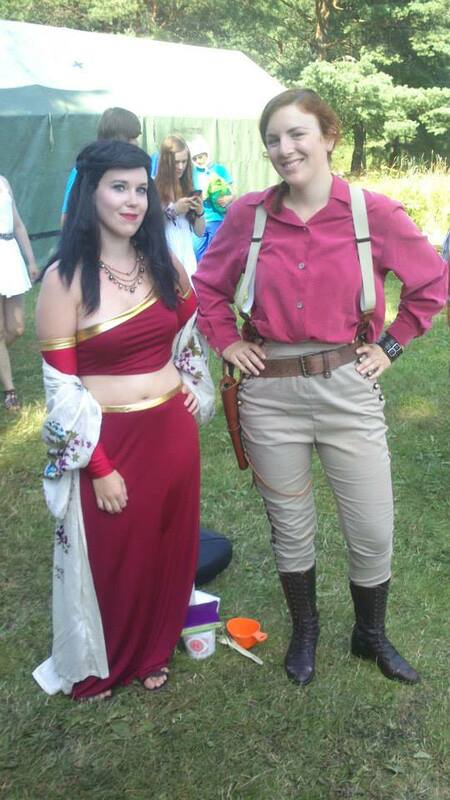 I have to tell you that wearing Inara that day was one of my best decision on NärCon. I didn't overheat and it was so comfortable. Well, the wig was a bit warm but other than that it worked. During the day or afternoon we kind of randomly got to see the Cosplay Chess. We sat a bit far off but it was still great. I loved how they used the music to match the action and also all the cosplayers who took part off it, it was a true joy to watch. At the evening it was NCC, which simply put is Nordic Cosplay Competition. It was awesome and we were standing close enough to the stage to see details and adore all the showmanship. I especially liked Riku-Risa's, all the props and well it was kind of like watching a magic show, a very nice looking magic show. And everyone else was also very good. Saturday as the big cosplay day, I went for my so far biggest cosplay: Peach. Since KodachiCon I'd added more organza for the underskirt which means it's now bigger (but I still want it even bigger) and also fixed some small things that needed fixing. The plan on Saturday was to watch the cosplay competition. It didn't really work. We was there for like twenty minutes and then we gave up because of the heat and the sun combined. And in the moment we got out from the stage place I turned around and saw Valerei, Madiirje's friend which we had searched for the entire convention, on the stage as Prince Gumball. It all ended well after I had convinced Madiirje that it was in fact Valerei on stage and we ended up going to this nice restaurant next to McDonalds which had so good food and we didn't even had to stand in line for it like all those poor souls that went to Donalds. I also think I kind of half scared a girl who cosplayed Yuuko with a Watanuki from xxxHOLiC when I just ran up to her and half screamed that she looked so good (the fact that she cosplayed from one of my favorite covers only made it better) wearing Peach. The only other thing we had planed for Saturday was Q&A with Gary Russell. I can tell you this: after that I became a bigger fan of Doctor Who to the point that I had to rewatch the Ninth Doctor again (he is my favourite, just fantastic!). A little after that it was Late Night on NärCon, which was kind of like a late night tv show only live at the big stage. Of course Gary Russell were there and the hosts force him and an american guy to play a game where they guess Swedish words and expressions. The audience favourite was off course 'lagom' closed followed by 'fika'. Saturday was going home day. Mostly we hanged out at SARZ (were we been stationed for most of the time we didn't do anything else) and checked out the bus schedule for catching the train home. The most exiting thing was to take the local bus from the convention to the train station. Yeah, lots of people with lots of packing on a local bus where the locals have no idea what's going on it kind of fun, mostly because they had no idea what we were doing there and it was crowded and the floors were filled with big trunks of what I guess was mostly costumes. 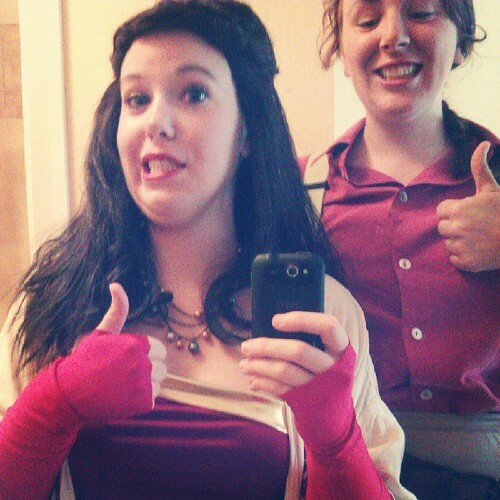 So to sum up NärCon: it was a blast even though it was super hot and we didn't really do anything. I got to see awesome cosplays and play a lot of games at SARZ where we kind of went when we had nothing else to do. During the con we almost planed for next summer NärCon, or the cosplays at least. So we are coming back. Then I spended a week at work before I flow up to Visby for almost a week in medieval times. But that you can check out at mine and Madiirje's medieval blog: MeraMedeltid. But I guess I've had a busy summer, mostly at different medieval and viking markets but I also finally got to NärCon. So if you have been tough enough to manage throughout this entire wall of text. Congratulation, you have earned yourself an digital cookie! Now I should go back to work and not writing enormous great walls of text. Bye!